After that pesky box of noodles jumped into my arms again from the pantry, I made it a point to make lasagna and put it out of its misery. 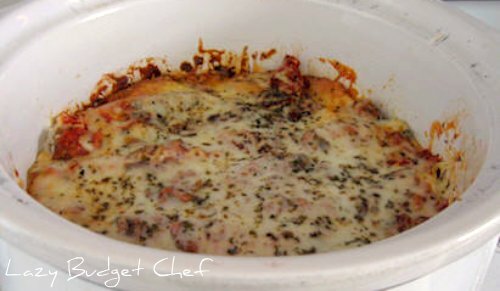 I heard that you could cook lasagna in a slow cooker. I did an Internet search. Some insisted you have to use no boil lasagna noodles, others didn’t. Some used jarred spaghetti sauce (cheater!) while others made their own, which didn’t sound as good as my Grandma’s sauce and her straight from an Italian neighbor lasagna recipe. 3. Drain the grease, if any from the mixture and return it to the pan. 5. Mix together mozzarella cheese and de soupified cottage cheese in a separate bowl and set aside. 6. If you want to oil the sides and bottom of your slow cooker, do it now. I didn’t grease mine because I forgot and the food didn’t stick to the sides of the crock. As always your mileage may vary. 10. Alternate noodle layer, sauce layer, and noodle cheese layer until you’ve reached the top of the slow cooker. Important: Start with a sauce layer and make sure you end with a sauce layer. Sit down to dinner and eat! This post is revised from my original post Crock Pot Slow Cooker Lasagna I wrote on my Green living and DIY blog Condo Blues 4/30/10. I've heard this can be done, but am always skeptical of noodles in the slow cooker. How were they? Non-mushy? I have a total textural issue with mushy things, so I've been leery of trying this. Rebecca - I used regular lasagna noodles and they came out like regular lasagna noodles. I was really surprised! It came out so well that this is my preferred way to make lasagna now. Love that you used Turkey in this recipe. Thanks so much for linking up to the Iron Chef Challenge!!! I just made this for dinner!! Well make it again!